Brief Description: Whether a player of golf or an armchair enthusiast, answering this quiz book’s 1,750 challenging questions correctly is likely to be your greatest handicap! And, for the most ardent of golfing aficionados, if you manage to putt your way through the first part of the book relatively easily, the latter sections aimed at the expert will no doubt land you in a few bunkers! Covering every imaginable tournament, as well as golf course locations, golfing personalities past and present, trophies, sponsors, nationalities, leading money winners, golfing terminology and much, much more, this is as much a useful reference book of facts and figures and a celebration of the great events and players in golfing history as it is a quiz book. This book has all the answers and in every respect is guaranteed to keep the 19th hole buzzing for hours on end. Special Note: £1 from every copy of the book sold will go to 'Cancer Research UK' Charity. No self respecting Scotsman would be without this Golf Quiz book. 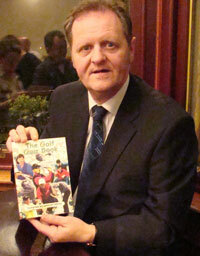 (Photo: Andy Ritchie with a copy of 'The Golf Quiz Book'). This book is the ultimate test for every golf fan out there with a fitting Foreword from one of the heroes from the 36th Ryder Cup Match, Darren Clarke. It covers just about everything you might dream of asking a question about in the sport of golf, it certainly had me unplayable a few times along the way. It is also gratifying to know that £1 from every book sold will go to support Breast Cancer research. 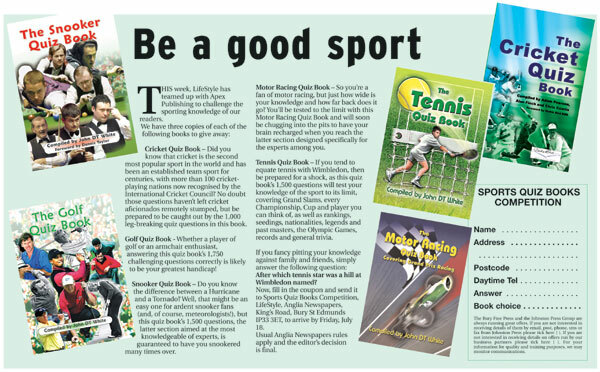 The Golf Quiz Book will entertain you, your family and your friends for hours with many interesting subjects and questions on just about all you could ever imagine covering the game of golf. And it is nice to se that £1 from every copy sold is being donated to Breast Cancer. 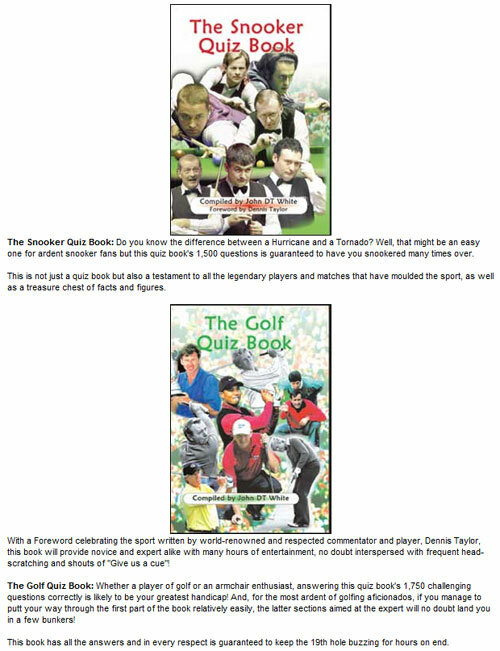 The Golf Quiz Book is one of those books your brother, your Dad, your Uncle, your Grandfather and even your Mum will enjoy. But be careful it is full of teasers that may leave you slightly over par as you skip through each round. And by buying it you are helping out a most deserving cause, Breast Cancer. I was delighted when John, a fellow Northern Ireland man, wrote to me and asked me to write the Foreword to his “Golf Quiz Book”. Golf has provided me with so many fond memories from the time I turned Professional in 1990 on both a personal level and on a team level with my fellow Ryder Cup team members. I was impressed with John’s kind offer to donate £1 from every copy of this book sold to Cancer Research UK, a charity close to my heart following the death of my wife, Heather from this debilitating disease. And if you wish to make a donation to Cancer Research, and I urge you to consider doing so, you can contribute by visiting their website – http://www.cancerresearchuk.org/. The game of Golf has so many wonderful tournaments from the four Majors to the Ryder Cup and of course so many gifted Golfers have graced the greens throughout the history of the sport. Golfing Legends such as Jack Nicklaus, Arnold Palmer, Ben Hogan, Gene Sarazen, Tom Watson, Greg Norman and Seve Ballesteros have all played the game with their own charisma and exciting style of play. Added to the latter we have today’s players who all seem to possess so much flair and creativity – players such as Phil Mickelson, Vijay Singh, Sergio Garcia, Tiger Woods and many, many more. Indeed, looking around the Professional Tour circuit today we can see world class players from all corners of the globe – America, England, Sweden, Ireland, Scotland, Spain and of course my own Northern Ireland. Golf truly is a worldwide sport and is enjoyed by millions of people across the globe. What I love so much about the game is that any player can beat a fellow professional regardless of world rankings because golf truly is a game of millimetres. Believe me if you have an off day then any course in the world is going to punish you. So I really do hope you enjoy John’s “Golf Quiz Book” as much as I enjoyed it. The questions tested my own memory of Tournaments over the years. Thank you John for bringing back may wonderful memories of a Sport that has provided me with so much happiness and joy in my life. This book has it all from the history of the sport to past masters to the tournaments to the players of today. I even learned a few things I did not know prior to reading John’s Book. An excellent read and a must for all golfing fans out there. This book is a must for all golfing enthusiasts, with 1,750 questions it will keep you puzzled for hours. I am fully aware that readers of this magazine number many golf fanatics including members of local golf clubs. It was armed with those facts and after visiting St. Andrews that I reviewed a Golf Quiz Book which I think you will find very useful and challenging. If you don’t know much about golf you will find that a bit of a handicap but the aficionados, the single handicap players will manage to putt their way through the first part of the book with relative ease up to par 74 - sorry page 74 before hitting the back 150 pages where I guarantee you will find a bunker or two. The author John DT White has covered most aspects of the game, tournaments, course locations, trophies, sponsorship and even golfing terminology. This is much more than a simple quiz book, it’s a reference book of facts and figures which is bound to keep the 19th buzzing. 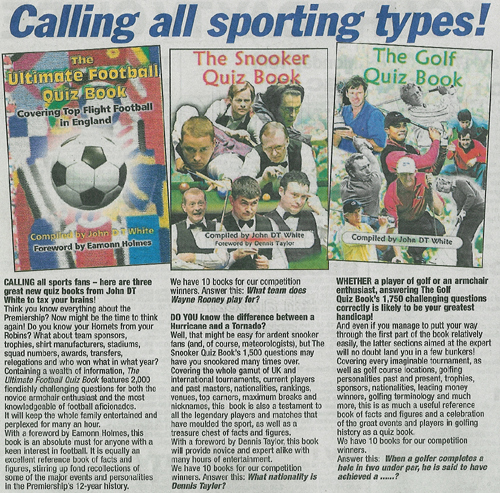 So whether you enjoy the game or simply set the questions at the quiz night at your local club this is a comprehensive quiz book with 1,750 questions and the answers. The good news for readers of the Gourock and District Magazine and its sister magazines is that we have one to give to one lucky reader. Simply answer this question and send your answer on a postcard. Question: Can you name the Scottish rookie who won the 2004 Volvo PGA championship? * “The Golf Quiz Book” compiled by John DT White, published by APEX, ISBN number 1-904444-28-8. 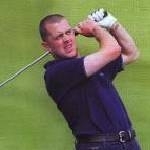 Hartlepool has a history of golfing greats including the current French Open Champion, Graeme Storm. The town has three courses and many thousands of players play the greens each week and enjoy golfing trips abroad. 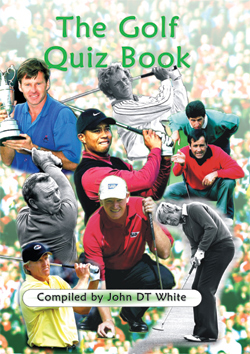 If you are looking for a Christmas gift for the golfer in your life then John DT Whites The Golf Quiz Book will give many hours of enjoyment. So whether you enjoy the game or simply set the questions at the quiz night at your local golf club this is a comprehensive quiz book with 1,750 questions and the answers. Text NBN with the answer and your name to 07887 995588 for your chance to win. Normal sending charge applies. 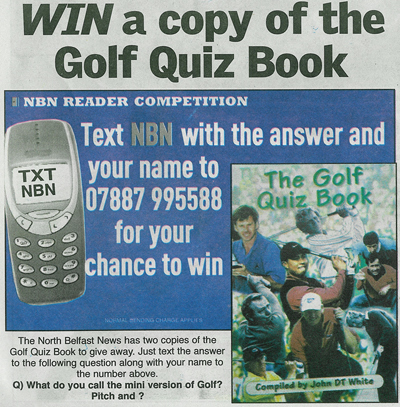 The North Belfast News has two copies of The Golf Quiz Book to give away. Just text the answer to the following question along with your name to the number above. Q) WHAT DO YOU CALL THE MINI VERSION OF GOLF? PITCH AND ? Text SBN with the answer and your name to 07887 995588 for your chance to win. Normal sending charge applies. 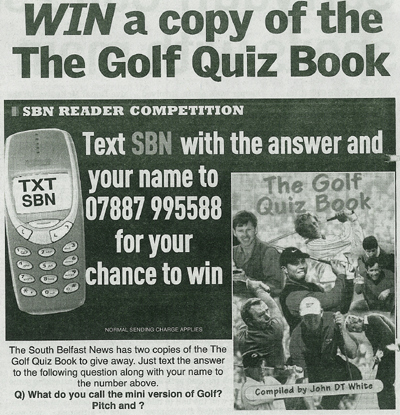 The South Belfast News has two copies of The Golf Quiz Book to give away. Just text the answer to the following question along with your name to the number above. The Golf Quiz Book: £7.99. A mixed bag of golf questions ranging from the simplistic to the unbelievably difficult. Most questions, thankfully, fall somewhere between these two extremes and make for an enjoyable challenge. Well researched and perfect for an afternoon with the family. Colchester Garrison 107 FM featured 'The Golf Quiz Book' compiled by John DT White on 'The Liz Mullen Show', they also gave a copy away in a radio competition.